Police have started searching the scene of a train crash on a level crossing in Lincolnshire in which two people died. Both victims were occupants of a van hit by the train on Monday at an unmanned farm crossing at Helpringham Fen near Sleaford. On Tuesday they were named as Vic Bee, 50, and Roy Wilkinson,47, who worked for electricity firm Central Networks and were from the Boston area. The train driver and guard were taken to hospital suffering from shock. The men killed were carrying out routine maintenance when the crash happened. Assistant Chief Constable Paul Nicholas, of British Transport Police, said search teams would be removing any debris and looking for clues as to what caused the crash. 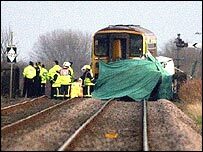 The accident comes a month after the Berkshire rail tragedy in which seven people died when a London to Plymouth train hit a car which had been driven on to an automatic half-barrier crossing. The incident in Lincolnshire was just a few miles from the scene of a similar collision last month, when a train full of schoolchildren hit level crossing barriers at Rowston. Monday's incident happened when the single-carriage Central Trains 153 diesel, which left Peterborough at 1241GMT, collided with the van 45 minutes later on what is known as a user-worked crossing. Network Rail said there were nearly 4,000 such crossings, mostly for farmers to cross from one field to another. Det Supt David Farrelly, from British Transport Police, said: "We need to understand how the vehicle came to be on the crossing and understand why it came into contact with the train on that farm crossing. "We are keeping an open mind and not closing off any course of inquiry." The line between Lincoln and Peterborough is expected to remain closed until Tuesday afternoon. There were 24 incidents of collisions between vehicles and trains at level crossings in the UK in 2003. The previous year there had been 16, and there were 17 in 2001.